After 16 Years, Sharad Navratri will be of 10 Days? This is happening after 16 long years, the last time being in 2000. Rejoicing the hearts of all devotees and Garba enthusiasts, the nine day celebration of Navratri spreads joy and happiness all over the world. In fact, it’s a special chance for all Garba lovers to dance with utmost enthusiasm. This year, Navratri will be a 10 day affair! It is a great opportunity for devotees to worship Goddess Durga and its nine forms one more day because this year celebration will go for one more day. ‘Prathama Thithi’- the first day of Navratri as marked in the Hindu Calender, Vikram Samvat 2073 will continue for two consecutive days, i.e, on October 1st and October 2nd. In addition, the night days of celebration will comprise two weekends thus, adding delight to the joy amongst all Garba enthusiasts. Do you want to know why Navratri is of ten days this year in 2016, after the 16 years? It is because the Pratipada Tithi will continue for two days during navratri this year. This time Pitra Paksha (Shraadh Tithi) is ending in 15 days, instead of 16 days like every year. According to priests, this time Panchami and Shasthi Tithi was on the same day in Pitra Paksha, so there was one day less. While during the Navratri festival, Pratipada will be celebrated continuously on two days so Navami will be on the 10th day. On the 11th day, i.e. on October 11, it will be Dusshera (Vijayadashmi) festival. According to Astrologers, people can see this type of changes in Navratri Dates, due to increment and decrement of Tithis. These are the main reasons for 10 days of Navratri celebration after 16 years. After “Shraadh or Pitra Paksha” come to an end, the piousness of Shardiya Navaratra would commence. This year, Navratri will start from 1st October, 2016. Maa Durga will arrive by sitting on a horse and will depart on a buffalo, which is considered very auspicious. In 2016, Shardiya Navratri is during the Gajkesri Yog. Ghat Visarjan will be held on the ninth day whereas Dusshera is going to be celebrated on the eleventh day. This year, India’s two most important festivals will be celebrated in October. Diwali will be celebrated on 30th October with great fervor and joy. Known as Pratipada, on the first day of Navratri, Maa Durga is venerated as Shailputri. ‘Shail’ signifies mountains whereas ‘Putri’ stands for daughter. On the first day, it’s auspicious to wear red colored clothes. 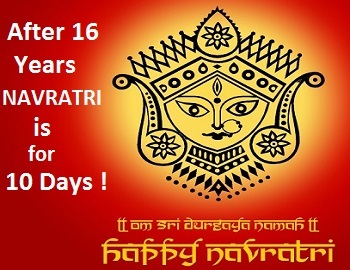 First day of Navratri will be celebrated on 1st October and 2nd October, 2016. On the second day, the Goddess is worshipped as Brahmacharini. This form of Durga grants emancipation and prosperity. Wear blue clothes during the second day of Navratri. Second day will be celebrated on 3rd October, 2016. On the third of Navratri, Chandraghanta is venerated. The Goddess stands for valour and courage. Kushmanda is worshipped on the fourth day of Navratri. She is characterized by eight to ten hands and devotees wear yellow clothes on this day. The fifth day is marked by the worshipping of Skandamata - mother of Kartikeya. On the fifth day of Navratri, devouts wear green shaded clothes. Goddess Katyayani is worshipped on the sixth day of Navratri. As per Hindu mythology, Kata observed myriad austerities to accept Devi as daughter. The goddess, when impressed with the devotions, blessed him with this boon. Kata was blessed with a child known as Katyayani. The seventh day is devoted to Goddess Kalratri which signifies dark night. The Goddess, featuring dark complexion characterizes an aggressive posture. She protects the devotees from different troubles. The color of Saptami is orange. On this auspicious day, Maha Gauri is worshipped. Symbolizing beauty and serenity, the goddess washes evils through her piousness. Wear white color on this pious day. Siddhidatri is worshipped on the ninth day. It represents eight siddhis. It is the last of the festival and devotees wear pink shade on the day. The tenth day marks the end of good over evil. On this days Dussehra is celebrated in all parts of India. As it is a ten days affair in 2016, the ‘Pratipada’, the first day will be celebrated on 1st and 2nd October. As it is a festival of joy, certainly, you must be looking forward to immerse in the auspiciousness of the festival and welcome the Goddess with open hands.